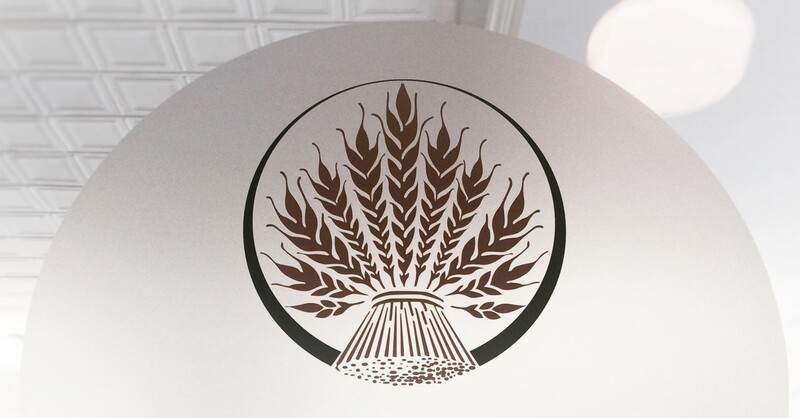 Canterbury Investment Management - What if the Market Turned Upside-Down? 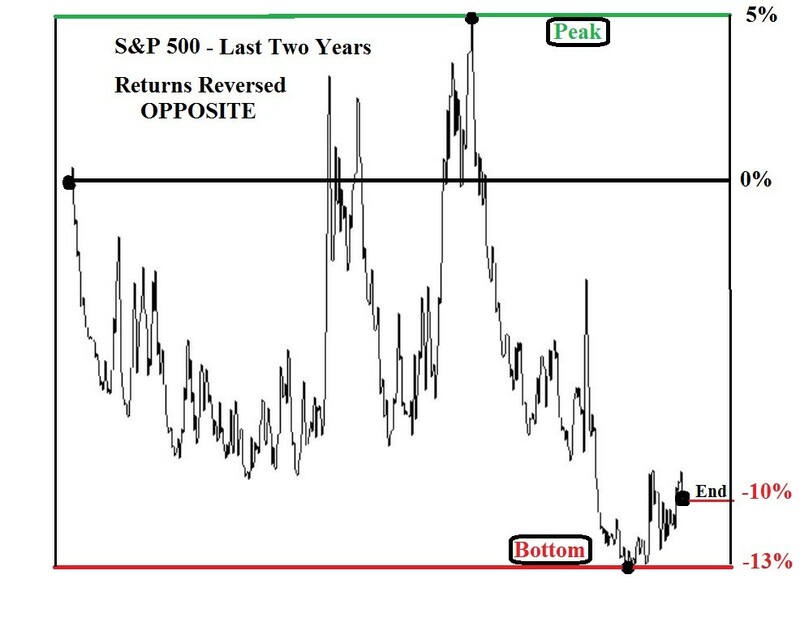 What if the Market Turned Upside-Down? Market State 2: Bullish (22 days): Market State 2 represents a long term bullish environment and low market volatility. The S&P 500 continues to hold above the May 2015 high. May’s peak was followed by substantial market declines that occurred between late July and August 2015 and then again between November 2015 and mid-February 2016. During that time, most major global equity indexes dropped in excess of 20%. Canterbury Volatility Index (CVI 53) Volatility, as measured by the CVI, declined another 3 points last week. 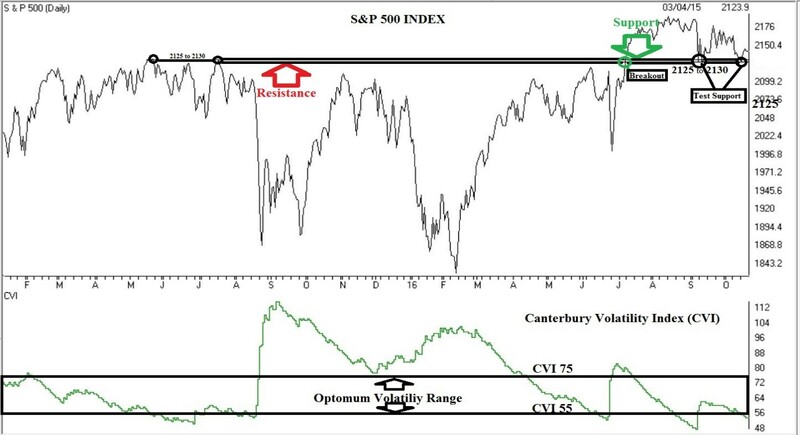 The optimum volatility range, as measured by the CVI, is about CVI 75 on the high side and around CVI 55 for the low. The market’s volatility has now declined below the optimum range. That said there is no reason for concern at this time. The market continues to trade efficiently, the benefit of diversification remains high (low benefit of diversification would see most securities moving together with higher volatility.) The current low volatility may be reflective of too much complacency among investors. As discussed in previous Weekly Updates, extreme low volatility (CVI 55 or lower) can sometimes be similar to squeezing down a spring. The result can be a sharp spike in volatility as the built up pressure is released. The probabilities of a one or two day outlier, meaning days up or down in the 2% range are likely if volatility continues to get squeezed down. Another week and another big yawn. The Dow finished the week unchanged, the S&P 500 and NASDAQ were up 0.4% and 0.8% respectively. Most major equity market indexes continue to trade below last year’s highs. 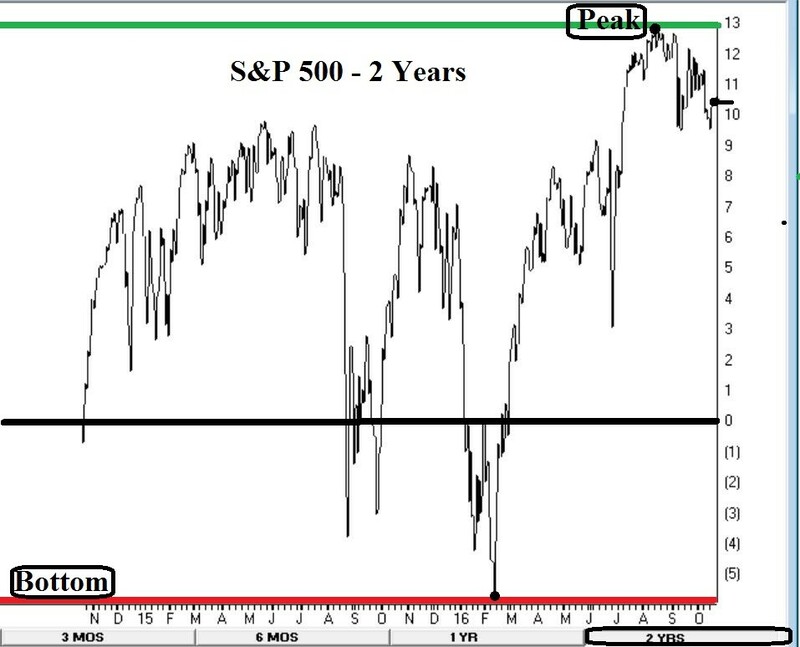 An exception would include the S&P 500 which barely broke above the 2015 May high and is currently trying to hold support, in the 2120 to 2025 trading range. The S&P 500 closed Friday at 2141. Please see chart below which includes the S&P 500 over the last two years ending on Friday, October 21, 2016. Last week we discussed an emotional flaw that can be at the root of why some investors make bad decisions. It is called “recent bias.” Many investors focus on past market swings and expect the future environment to look like the recent past. As can be seen from the chart above, a new high doesn’t mean very much if the market is only fractionally higher that it was about two years ago. The following is a good exercise in the dynamic nature of investor confidence and fear. Also, keep in mind that most indexes are still below their respective highs. Markets are driven by supply and demand. Supply and demand are counter intuitive (most are pessimistic at lows and most are optimistic at highs). Therefore, markets tend to have the largest gains, over short periods of time, and when investors least expect. For example, the S&P 500 was up 32.39% in 2013. On the other hand, “conservative” treasury bonds declined more than 15% during the same time. I remember that most were pessimistic and the general outlook for markets were not good GALLUP 1-2-2013: Americans Are Pessimistic, Miserable and Completely Fed Up. Volatile markets with sharp declines and advances can be emotionally draining for those who buy and hold during Transitional or Bearish - Market State environments. It is interesting to see how short memories can be following turbulent periods. How can investors be so complacent following the wild swings experienced over the last two years? Would your view of the market be different if it’s volatile swings had been the opposite from the way they actually were over the last two years? What if the market’s returns moved in the opposite direction from what they did over the last two years? In other words, what if each day’s return was opposite: today is down 22 points (example would be up 22 points). Tomorrow is up 12 points (example is down 12 points). This chart is OPPOSITE of the one above. Keep in mind that the chart above has the same sharp swings (up and down) as the actual chart. It is pretty obvious that investor confidence would be reeling at this point. The market action could have just as easily played out like the second chart over the last two years. Financial markets will experience extended periods in environments that have similar characteristics. There are periods when markets trend up, periods with high volatility coupled with sharp advances and declines, some will just trade within a narrow range. There can be many variations of market behavior over time. Markets are dynamic and ever-changing. As a result, portfolio management methods and processes must be at least as dynamic as the markets themselves. The Portfolio Thermostat’s primary objective is to avoid substantial declines when in Transitional and Bearish Market States. On the other hand, we also shift holdings to participate in ETFs that are in Bullish Security State environments. The first rule of thumb is that the portfolio management process must be able to define the difference between bull and bear markets. The second rule is that there is a process in place to make the proper adjustments to reflect the existing market environment. Such systems must be rules based, dynamic and testable. Statistically relevant evidence must be produced to show value added results.